Retaining your beautiful smile has many benefits. From self confidence levels to your overall health, proper oral care gives you a solid reason to smile. Some people, whether through life events or long-term neglect, are in need of more-intensive dental services to help them keep their whites pearly. 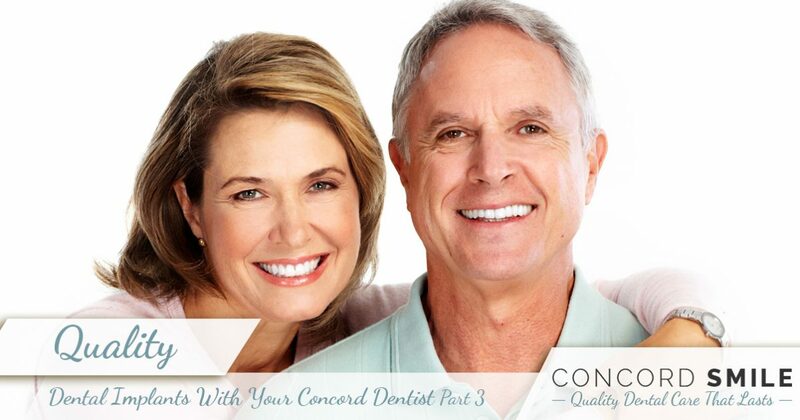 Since 2008, Concord Smile has proudly provided the best general, cosmetic, and restorative dentistry to Concord residents and beyond. From dental crowns to bridges and more, our experienced team is here and ready to optimize your smile to create the best results possible. The world of dental implants is one approach to restoring your smile and ensuring a higher level of health when compared to other options. Today, we’ll continue our look into the benefits of these permanent dentures. When you’re ready, be sure to contact our dental office in Concord for an appointment! When it comes to oral health, the sooner a missing tooth is replaced, the better your overall health will be. While a dental implant is a great option, it may not always be viable. Below are a few considerations that help to increase the chances of a dental implant being successful. Sufficient general health. It’s important to retain enough oral health to help an implant succeed. People with compromised immune systems, such as diabetics, may be at a higher risk for failure because their health is not strong enough to deal with the surgical procedure. Adequate gum health. The process of installing your implant requires the gums to support and retain the new tooth as osseointegration occurs. If your gums are inflamed or you are at a higher risk of periodontal disease, the chances of success decrease. Ample jaw support. One of the main benefits of a dental implant is its ability to help your jaw retain its strength and fullness. Without a tooth, the bone will begin to soften and reabsorb. Dental implants are helpful for optimizing jaw support, but only if there is enough bone there to begin with. Bone grafts may be required to help qualify you for this procedure. Avoiding bruxism. One common problem we see is the clenching of teeth, often while sleeping. While our dental implants are built to last, the act of grinding or clenching your teeth can work to sabotage the results of your procedure. Our dental experts will be able to help with this issue! Excellent oral care. While taking care of your oral health is highly recommended in general, it is even more important with a dental implant. The time and cost of this procedure can be seen as an investment, where proper health practices and dentist visits help to enhance the returns. Take care of your teeth and they’ll take care of you! Taking the time to ensure that all of these items are taken care of will help greatly in delivering you a healthy smile that is sure to shine for years to come. As the experts in restorative dentistry in Concord, Concord Smile is proud to help our patients through every stage of their oral health. Contact us today to learn more about our practice or to schedule your first appointment!